Before the age of fruit and vegetable imports, pickling was the only of preserving fresh produce over the long winter period. Pickling is an age-old Russian domestic art and remains popular today despite the arrival of modern innovations. 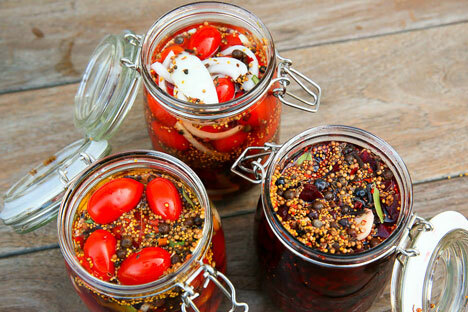 Jennifer Eremeeva offers a new interpretation of the classic Russian pickled tomatoes and beets. Pickles constitute an entirely separate food group in Russia. With a short and intense growing season and abundant cool, dry storage space available, pickling was an essential way to preserve nature’s bounty and provide the vitamins and flavors of vegetables throughout the long Russian winter. Pickling is a domestic art much prized by Russians, and it has never gone out of fashion despite modern innovations in refrigeration and preservation. This is clear from a visit to any farmer’s market in Russia, where one entire section is dedicated to pickled cucumbers, tomatoes, onions, garlic, mushrooms and other delicacies. Russian cuisine relies heavily on the salty and sour flavor accents of pickles, particularly soups such as schi and solyanka. Pickling brine is considered both an appetite whetter as well as a hangover cure, and is even used by some as a skin toner! Pickling for the pantry involves a lot of special equipment and very careful attention to sanitary conditions, but refrigerator pickles are an easy way to take part in this age-old, almost visceral tradition of capturing the flavor of summer in a jar. 2 tsp dill seed; 2 tsp of mixed peppercorns; 1 tsp red pepper flakes. Optional: If you like things on the sweet side, by all means add 1-3 whole cloves and 1 cinnamon stick, crushed. In the simple recipes which follow, I’ve taken the tradition of pickling whole tomatoes and tweaked it for a lighter version featuring more cherry tomatoes, which stay firmer and have more of an intense flavor. Pickled beets, while not as popular in classic Russian cuisine, are a wonderful way to enjoy these jewel-toned root vegetables. So, roll up your sleeves and get pickling! Combine the spices in a jar with a tight lid and store up to six months in a cool dark place. Choose your vinegar according to what you are pickling. White wine vinegar is great with onions and cucumbers, while red wine suits tomatoes and cabbage. Cider vinegar is perfect for beets. Combine all of the ingredients in a heavy-bottomed saucepan. Bring to a boil and stir with a wooden spoon until the sugar and salt are completely absorbed. Remove from the heat and let cool to room temperature before proceeding. Refrigerator pickles are not designed to last months and do not require the assiduous attention to sterilization that pantry canning does. However, it is important to make sure that the jars and their seals are thoroughly clean and bacteria free. 3 tbsp of pickling spice. A trip through the dishwasher on a “sanitary” cycle will ensure this, as will immersion in a pot of boiling water. I recommend you also scald the rubber seals of the jars in hot water after a thorough scrub with hot, soapy water. 1. Preheat the oven to 425ºF (220ºC). 2. Wrap the beets individually in a tight layer of aluminum foil and roast for 40 minutes. 3. Let the beets cool completely, then peel the outer skin and cut the beets to your desired size and thickness. 4. Assemble the ingredients and fill the jar, beginning with approximately 3 Tbl of pickling spices on the bottom, then a layer of beets, then half of the thyme, orange zest and ginger, and then the final layer of beets. 5. Whisk the pomegranate syrup into the brining liquid and pour carefully into the jar. 6. Seal the jar and place them in the refrigerator for 5-8 days before enjoying them. Beets will last up to 2 months in the refrigerator. Serve as a garnish for roasted meats, on toothpicks as a part of your finger food line-up, as colorful accents to salads, or as a salty element in a grain bowl or to boost the flavor of borscht. 1. Wash the tomatoes thoroughly, then pierce each one through the stem line with a toothpick or poultry skewer. This allows the tomatoes to sink in the brine and helps them absorb the flavor. 2. Layer the tomatoes in a clean jar: 3 tbsp of pickling spices on the bottom of the jar, then layer tomatoes, half of the thyme, onion, lemon zest and garlic, and so on, finishing with a layer of tomatoes. Pour the brine over the tomatoes until they are completely covered. Use the back of a clean stainless steel spoon to press the tomatoes gently down into the brine until they are completely submerged. 3. Seal the jar and place in the refrigerator for 5-8 days before tasting. Tomatoes will stay fresh in the refrigerator for up to 3 weeks. The uses for these tomatoes are almost endless. Try them alone, as a garnish, to liven up toasted sandwiches, with cheese, in soups and stews or as part of sauces for pasta. They make an excellent addition to grain bowls and are a marvelous accent of both color and flavor in winter salads.